SVS Prime Center (Black piano gloss) in mint condition. There's one tiny scratch on the top, back left (see pic). I'm the original owner (smoke and pet free). Item will be shipped in all original packaging. SVSound SB2000 Powered Subwoofer. Condition is Used. Local pickup only. SVS 20-39CS Plus black 16" round subwoofer. Grwat condition and incredible performance.. Power handling, 500 watts RMS. 4 Ohm load. 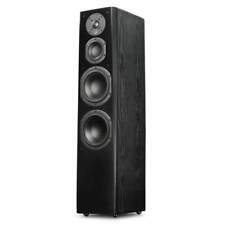 20 Hz tuning point /- 3 dB 20 Hz-100 Hz 39" tall, 16" in diameter Check out online reviews this unit is over the top in sound and range. No room in my new condo..I am downsizing and hate to give it up. Audiophiles will appreciate the value. Samson 1000 500w x 2 amplifier also available. Woofer 2x 5.25" (13.34 cm) polypropylene cones. Midrange Driver 3.5" (8.89 cm) polypropylene cone. Grille Cloth with pin/cup retention system. Frequency Response ± 3dB 48 Hz to 25 kHz. Weight 20.2 lb (9.16 kg). The included Multi-Angle Wall Bracket allows for hanging the speaker in any of four directions (up- or down-firing, and side- or rear-firing). Also included is a universal mounting option with a 1/4"-20 brass insert that works with other kits. Possibly the best surrounds money can buy honestly, and at a wholesale price too! My loss your gain! Port 1x 1.7" (4.3 cm) wide-flared, rear-firing. Weight 15.5 lb (7.0 kg) each. With Grille and Bumper Feet: 8 x 13.3 x 10.3" (20.3 x 33.8 x 26.2 cm). Crossover 2.3 kHz (12 dB/octave slopes). Selling everything you see pictured. SVS 12" Speaker. Original from SVS 25-31CS Sub. Light, efficient, and rigid, providing high SPL (Sound Pressure Level) with minimal distortion and the sense of utter transparency. That way everyone in your listening room gets the best performance. Green standby mode with less than 0.5 watts consumption. • Ported box subwoofer. SVS ULTRA BOOKSHELF - DESIGNED FOR THE DISCRIMINATING AUDIOPHILE. The non-parallel cabinet panels reduce standing waves within the cabinet, effectively eliminating frequency response coloration. The wedge-shaped front baffle and flush-mounted drivers reduce edge diffraction and improved on-axis high frequency response. Received as a gift last Xmas. Just opened the box to check it out and took pictures. Bass Authority. Scuffs and Scratches On Body(See Pictures). Normal Wear and Tear. Great Condition. SVS ULTRA CENTER-BLACK OAK Specs. Woofer 2x 6.5" (16.51 cm) composite glass-fiber cones. Weight 31 lb (14 kg). With Grille: 8.2 x 22.0 x 10.9" (20.82 x 55.88 x 27.68 cm). Grille Cloth with pin/cup retention system. Double thick MDF front baffle and optimized cabinet bracing make the PB16-Ultra sonically inert and resonant free for neutral and uncolored acoustic output. The large font front display is expertly imbedded in a hand machined front chamfer that angles the display for optimal viewing. (2) PAIR OF ULTRA REAR SURROUNDS (PIANO BLACK FINISH). (1) ONE ULTRA CENTER (PIANO BLACK). When the lights dim and the score fades in, they flood your room with dynamic audio realism and action. No compromise. Like a stick of dynamite, the SB–1000 is easy to conceal—but its impact hard to ignore. 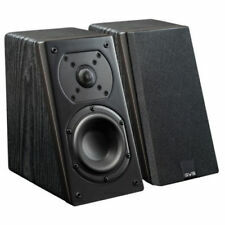 SVS PB1-ISD audiophile grade Subwoofer...nice! Briefly tested and all seems to be in good working condition. Sounds great! One set of (4) SVS Soundpath subwoofer isolation feet. Jets thunder through the sky. Bullets graze your ears. When the lights dim and the score fades in, they flood your room with dynamic audio realism and action. That way everyone in your listening room gets the best performance. 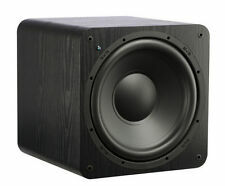 SVS PB-2000 12" 500W Subwoofer (Black Ash). 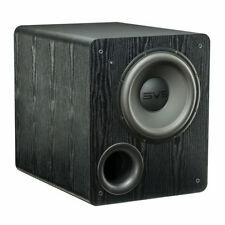 SVS PB-2000-BLACK ASH Specs. Enclosure Type Ported. Port 1x 4" (10.2 cm). Output Power RMS: 500 W. Frequency Response 17 to 260 Hz, ±3dB. 1x RCA line level / LFE input pair. SVS PB1000 Amp Only - Sledge STA-300D - 300W - Used Very Good ! SVS PB1000 10" Subwoofer / Driver Only - Used Very Good ! 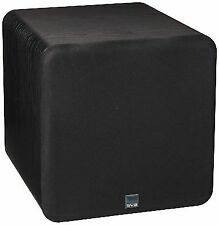 SV Sound PB12 OR PC12 Plus Home Subwoofer - FREE SHIPPING! AUTHORIZED DEALER!! SVS subwoofers are the darlings of radio deejays, pro musicians and home theater enthusiasts. These subwoofers combine high output with superior hardware for stellar performance that's refreshingly affordable on eBay. How do you decide between configurations? What types of SVS subwoofers are there? Bookshelf subwoofer: Fits on a bookshelf or some other raised surface for use with a home theater system. Floor tower subwoofer: You can position as desired for enhanced acoustics. Standalone subwoofer: For custom setups you can change periodically. Surround/satellite SVS subwoofers: Intended for use with your existing movie theater speaker system. Center channel subwoofers: These output both lower and upper-to-medium harmonics as well as dialogue and other non-musical noise. Do these particular SVS subwoofers come with wires? "Powered" indicates that the SVS subwoofer in question has a built-in amplifier. Powered subwoofers are also called "active" in that they differ from "passive" subwoofers, which require an external amplifier. Powered subwoofers come in handy when your setup requires an optimal ratio of the power supply and output between amp and subwoofer, such as inside your car. Luckily, if you're considering a subwoofer for your home or office theater system, you probably already have an amp built into the system's receiver or main console. Content provided for informational purposes only. eBay is not affiliated with or endorsed by SVS.